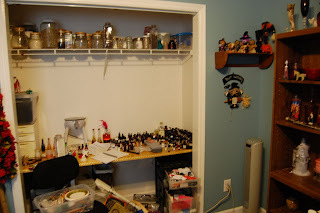 Phew - just got my blog organized - it looks now like it will go better with my main Studio Nocturna site. I'm in the process of re-designing all my sites and defining their purpose. 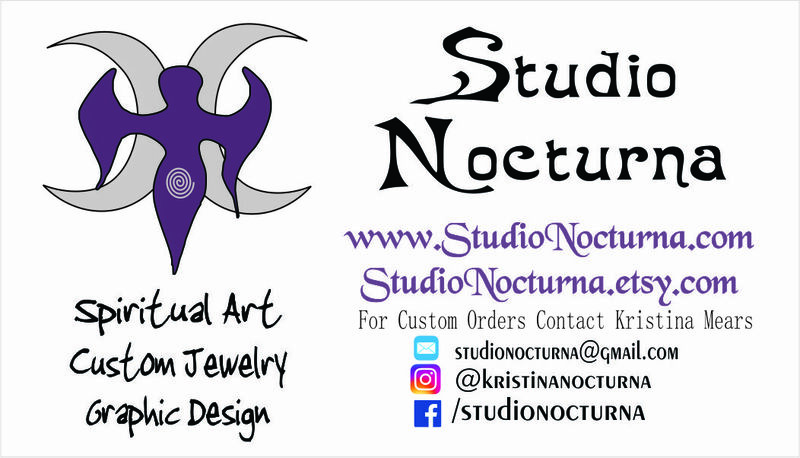 I've decided Studio Nocturna is my main site encompassing all I do - but it's main focus will be as a gallery for my photography, digital art, and One of a Kind creations like my spirit dolls and some of my jewelry. Luna Rose Creations will be the home of my ritual crafts and it will be getting a new look - more of a pagans in the woods kinda feel is what I want. Harvest Angel Creations will be the home to my production jewelry (glass and gemstone earrings, necklaces and bracelets that are not one-offs) and my non-ritual candles, and anything else I happen to make that doesn't have a mainly pagan theme. 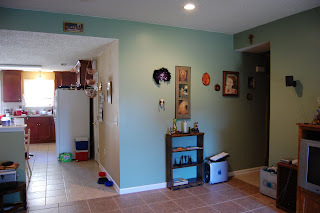 I may include my Catholic style rosaries there - I haven't decided if I just want to make it Christian friendly or spiritually neutral. It really needs work but I want to get my main three sites done first. While I'm doing all that in my virtual space I'm also trying to do the same in my real space. 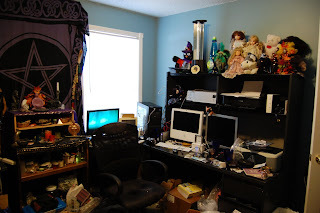 I need to make my office/craft room/altar room more useable and less of a crazy cluttered mess. And I have to do all this while working full time at my regular job. I'm probably going to let my World of Warcraft subscription go for a little while until I get caught up. 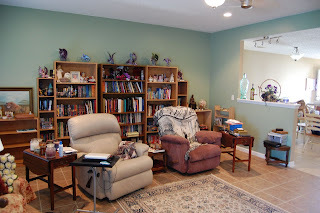 I started looking at my blog here again last night after referring a friend to one of my postings and realized my last post here was just under a year ago when I was getting ready for the spring craft and pagan festivals. I haven't been using this blog like I intended and that's gonna change this year. I will probably start with some older projects and writings. I haven't done a lot of new stuff in the last few months but I did create quite a few things in the early half of the year. I made a wedding spirit for a couple as their wedding gift, an Ogunn altar spirit commissioned by an online fan, several sculpted goddess pendants, gamer dice pendants, and runes. Last year was also the year I developed my god pendants to compliment the goddess pendants. Once festival season was over I seemed to have lost my inspiration and productivity. All I really felt like doing from summer onward was playing World of Warcraft. Part of it was a rush to get a character or two caught up with my friends before the new expansion changed everything. I still plan to keep playing but I want to balance my time better. I don't go to the Flying Monkey artist market anymore because a lot of things are changing that made it seem not worth the time and effort. I'm going to focus on online sales and whatever festivals and conventions I can do this year. I'd love to do some sci-fi cons soon too, since I started making things gamers and fantasy fans like too. I want to blog and write more- even if it meas bringing my netbook to work so I can type between deliveries. So this year I need to balance playing my favorite game, getting my health back on track, doing crafts and working on websites, my spirituality, and working full time. I've heard this event gets a lot of traffic - so I hope it's worth what I spent on the tent plus taking three days off from work. Not to mention my materials and time! I'm trying to get my website more use-able as well. I need to finish making new candles since I signed up as mainly a candle vendor for this event. I finished my Naturals Series and started on my new Coffee Shop series. Candy Shoppe will be next and I need to make a few more of my Luna Rose Originals. I've updated the Candles page of my site to list my current scents from the new series of candles. I will vend some of my jewelry - especially my dice and potion bottle pendants, and my earrings. The rules for this event require 75% of my display to be my primary craft. Of course I will have my oils available as well. When I vend at Moondance in May I will have a mainly pagan table. I will start soon on new ritual, sabbat, and deity candles. I will have several rune sets available, prayer beads, oils, and my gemstone jewelry. I hope the weather will be ok to bring out some of my spirit dolls. Is May actually next month? Maybe I should playing less World of Warcraft and doing more crafting! I've decided to create a series of candles that are 100% natural using soy wax and only essential oils, no fragrance oils and no artificial colors. The first scents available in the Luna Rose Creations Naturals series are: Lavender-Rosemary, Patchouli, Sunshine (a spicy citrus blend), Citrus Mint, Cinnamon, Spice, and Orange Spice. I have glass votive candles cooling now in these scents. Unfortunately it looks like I'm going to have to increase my candle prices. I sat down and figured the per candle cost of materials - not including production time and the overhead costs of my home workspace - just the materials and realized I'm barely making a profit. And that is with the materials I bought recently. I started out buying my wax at hobby stores, which costs way more than my online source. So it looks like I've been selling my previous candles at a loss. It looks like I have to increase my price to at least $4 a votive, if not up to $5... I'll need to calculate how much wax goes into my bigger jelly jars to decide how much they need to be. I really hate having to raise my prices, but I realized I am working with the best prices for my materials I can find. I plan to re-open my Luna Rose Creations Etsy account to list my candles and my non-ritual perfume oils, as well as any soaps, bath salts and lotions. 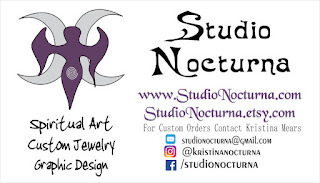 Studio Nocturna is all about the art and jewelry creations, and my newest account WebWitch is just for the spiritual ritual tools - ritual candles, runes, pendulums, prayer beads, oils, voodoo dolls, spell kits, etc... I'm doing this to keep my main account from getting too jumbled up to handle. It's still going to take a lot of work and I still have to take photos of my secondary craft studio in the laundry room - got boxes piled in there too... I don't know when I'll ever get it all unpacked!